Fish cakes with tartar sauce - for someone who isn't crazy about fish. Process tilapia (or any mild white fish) and onion and half the bread crumbs in food processor for just a couple of seconds until well mixed. Add dash or two of dill, salt and pepper to taste. Form into 4 patties. 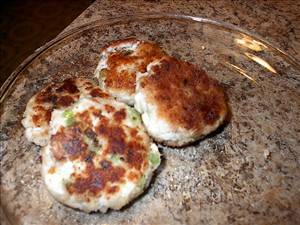 Lightly coat patties with rest of bread crumbs. Heat olive oil in frying pan and fry on both sides until outside is crispy and inside is cooked (about 3-4 minutes on each side). Stir mustard into mayonnaise, add squirt of lemon juice, salt and pepper to taste. Add a dollop on top of each fish cake. 128 members have added this recipe to their cookbook. They came out great, and tasted great. Will be making them often. Used seasoned Italian bread crumbs, and used 1 tsp Old Bay Seasoning in place of dill. Thanks to Shutterbug! I thought these were absolutely phenomenal; Susan, uncool to rate recipe so low when it appears as though you didn't even make them. If you're watching your fat intake, just don't make (or use) the tartar sauce. I, too, used homemade italian breadcrumbs and added a little diced bell pepper to fish. Oh - and I used tilapia I had actually cooked the night before (foil baked with lemon, salt & pepper). Thanks so much for recipe! I need to know the fat grams per serving as I am counting them. There are 330 calories in 1 serving of Tilapia Fish Cakes. Calorie break-down: 49% fat, 22% carbs, 29% protein.